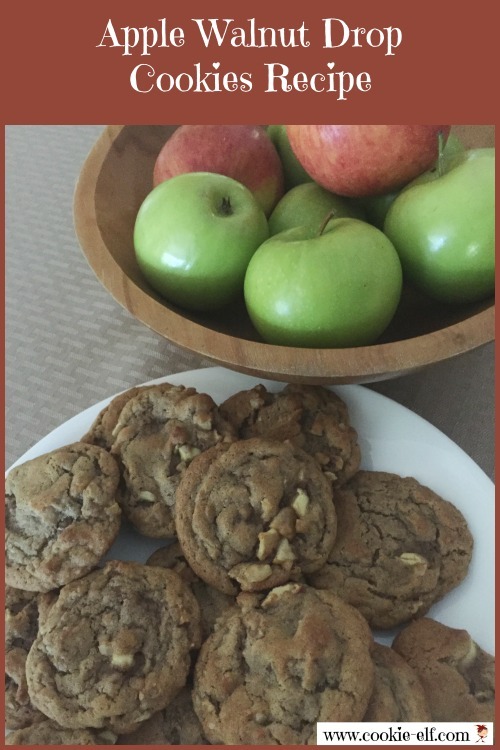 Easy Apple Walnut Drop Cookies Recipe: Use Just 1 Apple! Preheat oven to 375 °F. Line baking sheets with parchment paper or silicone baking mats. Set baking sheets aside. In a medium bowl, combine all-purpose flour, baking soda, salt, and spices. Set aside. In a separate bowl, with an electric mixer on medium speed, cream together butter and sugar until smooth. Stir in flour mixture a bit at a time, blending just until dry ingredients are absorbed. Fold in chopped apples and walnuts. Scoop cookie dough into walnut-sized balls. Place on baking sheets 2 inches apart. Bake for 8-10 minutes until edges and top surface of the cookies begin to turn golden brown. Remove the baking sheets from the oven. Allow cookies to sit for 5 minutes on the baking sheets to set before using a spatula to transfer them to a wire rack. Cool completely. You can use any variety of apples in this recipe, although tart varieties (like Granny Smith) are touted as the best to use in baking. Finely-diced apples give the cookie dough a smoother, more uniform texture. Larger pieces create a chunkier cookie dough texture. Get more cookie inspiration on our Drop Cookies Pinterest board.